Most backpacking trails vary only a few thousand feet elevation. However, many trails can be found above 10,000 feet. But what many people don’t take into consideration at these high altitudes is how these elevations affect their cooking. The higher the elevation, the lower the boiling point of water. When water boils at lower temperatures, it takes longer for foods to cook in or over water. The higher the elevation, the faster moisture evaporates. The higher the elevation, the faster leavening gases (air, carbon dioxide, and water vapor) expand. Does water take longer to boil at higher altitudes? A common misconception is that it actually takes longer to boil water at high altitudes. However, as we have explained, it is the exact opposite. The higher you are, the lower the boiling point. Thus, the water actually takes less time to get to this lower temperature. The confusion is around the fact that it takes more time to cook food in or over the water. This is because of the lower boiling point, which results in less heat, and not because it takes longer to reach high temperatures (although it can take longer to heat water at high altitudes because of colder temperatures and windy conditions, this is not a direct result of elevation gain). For foods that cook in 20 minutes or less at sea level, add 1 minute of cooking time for each 1,000 feet (310 meters) of elevation. For items taking more than 20 minutes to cook, add 2 minutes for each 1,000 feet of elevation. Because of this, you need to plan to spend more time burning fuel. Table comparing boiling points and cooking time to elevation. Backpacking in cold temperatures requires more fuel and cooking time increases with elevation. When in doubt, take an extra fuel bottle. For extremely high elevations a pressure cooker is often used in order to compensate for the low atmospheric pressure. 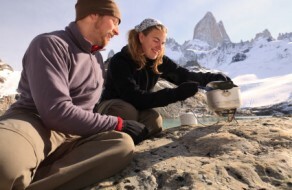 Without the use of a pressure cooker at these high altitudes where water boils at temperatures significantly below 212° F (100° C), foods being prepared in or on boiling water may be left under-cooked. Because of this, many mountain climbers use lightweight pressure cookers. Although this is not necessary for most backpacking, it’s still important to consider lower boiling points and cooking time to plan how much fuel to bring.